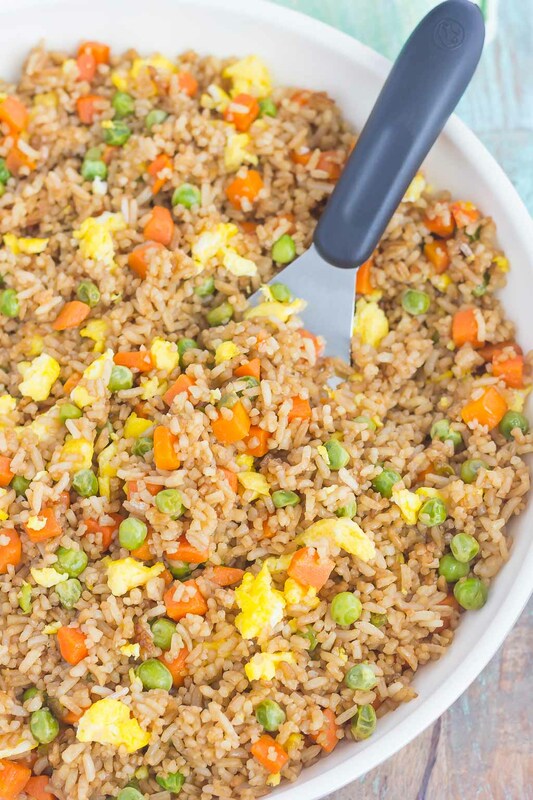 Fast, easy, and full of flavor this Easy Fried Rice tastes like your favorite Chinese take-out! One thing that I look forward to most on the weekends is spending time my kitchen. Nothing is better to me than enjoying a lazy Sunday by whipping up a delicious meal or baking a new treat. But once Monday rolls around, I’m all about easy foods that are ready in no time. I don’t mind doing light cooking, but spending over an hour or so on dinner is just not appealing to me. I would rather save that for the weekends! A favorite meal of mine (and the hubster, too) is orange chicken. We love this stuff! We buy a packaged kind that you just make in the oven, and probably eat it once every week or two! It’s quick, easy, and delicious. I usually serve it with a side of white rice, and we’re set for the night. However, I wanted to get a little creative with our orange chicken. Plain rice can be so boring at times. So to carry on with the theme of our Chinese meal, I decided to make this Easy Fried Rice. Fast, easy, and full of flavor this side dish tastes like your favorite Chinese take-out! And this Easy Fried Rice is a breeze to whip up! It only took about a half hour to prepare, perfect for those busy week night meals! 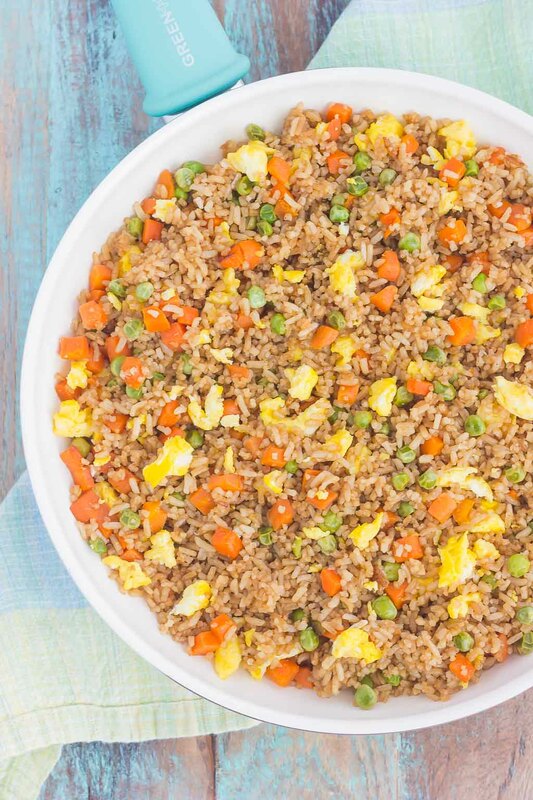 And if you love fried rice, this is sure to be a favorite in your house. You can skip the takeout and make your own, as I guarantee it will taste just as good. 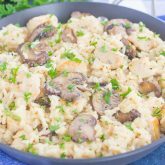 The best part about this Easy Friend Rice is that you can customize it depending on your tastes. I love when fried rice is prepared with scrambled eggs, so I knew I had to incorporate that into this dish. And the prep work is so simple! Start by scrambling your eggs in a pan, then remove to a plate. Saute your veggies, add in some cooked rice, and then stir in some seasonings and soy sauce. Once the rice mixture has simmered, top with the scrambled eggs and sesame seed oil. In no time, you will have a tasty side dish, or a main dish if you add in some chicken or beef! What could be easier than that? So if you’re like me and don’t want all the fuss of the prep work during the week, check out this Easy Fried Rice! Melt butter in a large skillet over medium heat. Add eggs and cook until scrambled. Remove to plate. In the same skillet, add frozen peas and carrots, and minced onion. Saute for 5 minutes or until tender. Add minced garlic and sauté for about 30 seconds. Add rice and soy sauce to skillet, stirring to combine. Be sure to taste rice with soy sauce, as you may need to increase/decrease amount, depending on your preference. Cook for 7-10 minutes, stirring occasionally, in order to fry rice. Turn heat to low, add eggs and sesame oil. Stir to combine. Be sure to taste the amount of soy sauce and sesame oil as you cook. I used a higher content of both, but you can increase/decrease to your liking. 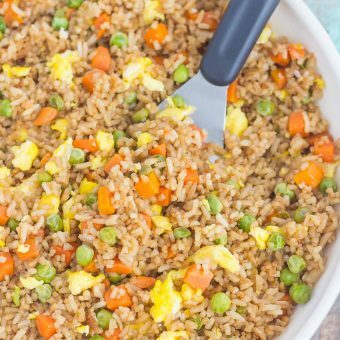 fried rice is one of my all time favorite dinners to whip up! I usually have it at least once a week! Gayle, this looks DE-licious ;-) love the soy sauce and seasame oil combo! have a great weekend! Thanks so much, Michele! Now that I've finally made my own version, it has become a weekly rotation in my house, too! Fried rice is definitely a meal in itself for me, too! Thanks so much for the kind words, Aprita! Fried rice is perfect for busy week nights. I am the same as you, I like to spend lots of time in the kitchen at the weekend. It is my relaxing time! I'm glad you know how I feel, Dannii! Fortunately, fried rice is one meal that I actually look forward to making on weeknights because it's just so easy! We love fried rice in my house. Yours looks so yummy and flavorful! I'm dying to try it. Pinning! Fried rice is the best, isn't it? Thanks so much for the pin, Jen! Me too, Medha! It's so versatile too, so there are tons of different flavor combinations to create! Your weekends sound like mine, Gayle! When Monday gets here all I want is simple and easy. We love orange chicken in our house too. I'll have to try this fried rice out the next chance I get, it looks delicious! Yes, I'm all about easy meals during the week, Danielle! But this is one dish that I look forward to making during the week! Thanks so much for the rice love! Where I live, fried rice like this at the local grocery store (it is really good though) is $9 a pound! So it's time to learn to make it. I think adding chicken like you said would be perfect. And orange chicken is scrumptious, perfect to go alongside this easy rice. It's the dynamic duo!! Woah that's a lot of money for a pound of fried rice! I think you would love this dish if you tried it! 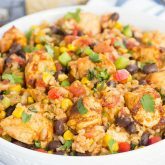 It's so versatile, so adding chicken or beef would make it a great meal! Thanks for the compliments, Laura! I could not agree more about weekday vs weekend cooking! Love this simple quick fix! This is the perfect, quick and easy week night dinner. I've never tried making fried rice at home, but now I think I should. I might even add chicken. Thanks for sharing Gayle! Chicken would be the perfect addition to this rice, Mira! And this dish is so easy to make during the week. It's become a weekly rotation in my house! Love this! Pinned! These pictures are so pretty too! I am more the baker, and my S.O. is more the cook, so he's made it for us before, but I think he just throws things in without rhyme or reason. Haha! I will share this with him too! I love that you added sesame oil. Yum. Thanks for sharing! Thanks so much for the kind words and pin, Sarah! This fried rice is so easy to make, and so versatile, too. I love playing around with the different seasonings and veggies to go in here! Yep, this falls into the easy category. I am a big fan of Chinese food. In fact I have leftovers from last night with fried rice for my lunch today. But your rice looks far more interesting. Fried rice is so good as leftovers, sometimes I think it's even better the next day! I hope you try this rice sometime, Carol! I think you would love it! this looks so good Gayle! loving all the flavors in there! Pinned! Thanks so much for the rice love and pin, Manali! I love fried rice, and yours looks perfect! It's something I never make at home, in fact, I never make Asian inspired food. That needs to change! Orange chicken is one of my favorite dishes...that sounds so good! Thanks, Marcie! I tried making homemade orange chicken once and that was a fail. But, this fried rice is so easy and practically fail-proof! Love fried rice! This looks delicious, Gayle! I love fried rice, and this looks delicious! It's probably a thousand times better than the take-out stuff too! Thanks, Stacey! And yes, it definitely rivals the take out rice, and is healthier, too! This looks delicious, Gayle! 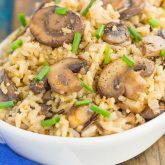 Love fried rice, it's the perfect easy week night dish :) I always look forward to lazy Sunday cooking and baking too :) Hope you have a great weekend! Thanks, Kelly! This dish is on my weekly rotation because of how easy and delicious it is! Hope you have a wonderful weekend, too! Great minds think alike, Olivia! :) And rice definitely makes the perfect meal! Oh that's a great idea to add garlic butter, Olivia! I will have to try that next time! Thanks so much for the kind words! Fried Rice is one of my favorites to order at Chinese restaurants! And your version looks delicious! Thanks, Christina! I love ordering fried rice out too, but this definitely rivals restaurant versions! Yum!!! I never think to order fried rice but it is probably way better just to make it at home! Your orange chicken sounds good too....hint, hint. Ha ha thanks, Lindsey! These fried rice is definitely better than take out, and so easy, too! This is great, Gayle! I always want to make fried rice but then I just get lazy and order it. But I will actually try yours. My husband will love me forever (oh wait, he does anyway, but yeah)! 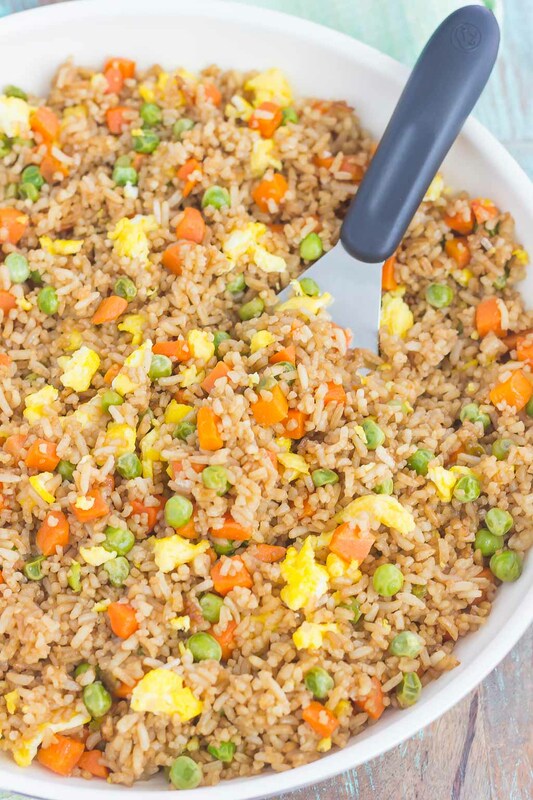 Maybe your husband will love you even more if you make this fried rice! :) It is so easy to whip up and I love that you can control what goes into it. Thanks for the kind words, Mir! I love love fried rice! One of my family's all-time fav dinner items. This looks amazing, Gayle! Thanks for the kind words, Tash! This is definitely an easy meal to whip up. I hope you love it if you try it! Love fried rice! 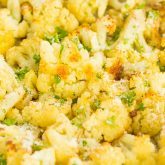 I like adding whatever leftovers or about-to-go-bad veggies I have on hand into it-- it's so versatile! Thanks so much for the kind words and pin, Ceara! Frozen veggies definitely save me a lot of time! I hope you love this fried rice if you try it! Hi Gayle....! fabulous....this is one of my favorite recipe till now of your blog. This looks sooo yummy & delicious and also easy to make, i will tried to making this fried rice...Thanks for sharing...! Hi Samantha! I'm so glad you like this recipe. I hope you love it if you try it. Please let me know how it turned out and thanks for stopping by!